Learn how to build an animatronic head with master creature effects mechanic Craig Caton-Largent (Jurassic Park, Terminator 2: Judgment Day, Predator 2). 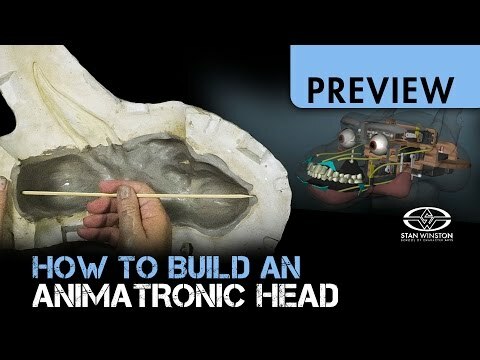 In Part 1 of his 4-part webcourse series on DIY mechanical characters, Caton-Largent teaches you how to create an epoxy & fiberglass underskull, the critical first step in building facial animatronics for your character creations. Hello, I have a ton of questions. First question is about the Servo supply list. It appears as though the number of Hitec HS-82MG needed is a total of 11, is this correct? Also, I seem to be confused and missing a step. 3) Put WED type clay into it. 5) I'm lost...Spread plaster on the inside of the WED clay? And stick it together? And wait for it to dry? 7) Cover it with bandages? The steps you are mentioning are for creating the fiberglass underskull. You take the mold that was used to create the skin of your animatronic character and line the inside with clay that is the approximate thickness of the character's skin, and then create a mold of that internal cavity using plaster bandages. With complex lessons like this, I find re-watching a few chapters (or sometimes the entire lesson) helps, since you have more context having seen more of the process. Hello! For my sculpture, I only need my creature to be poseable. He doesn’t need to have any electric movement as long as I could move him with my hands between poses. Do you think this could work, and I could avoid spending $300 in servos? Never done anything animatronic before so this might be stupid but who knows. I have to build the rest of his poseable body too so I‘m trying to save as much as possible wherever I can. If you don't need your character to move on its own, and just be posed, it should be much easier and less complicated. One quick way to make a character poseable is to add aluminum armature wire, or stiffer steel wire to the joints.